I read a story in a textbook years ago about a university that, when planning their new system of sidewalks between the buildings, planted grass and let the paths that people wore into the grass be the guideline for the new sidewalks that they would put in the next year...does this sound familiar, or can anyone shed some light on this (the story - not the textbook). They are called desire lines. Wikipedia. I have heard that same university story as describing UC Davis, but I guess it's up to google to determine the veracity of that. I know that planners at a number of universities have used this technique in the past. Certainly CSU Sacramento recently placed paved/stone paths through areas that were previously solid lawn, using the dirt-trod pedestrian paths as a guide. I've seen this done at UC Berkeley as well, on the west side of campus and near the faculty club and music building. I did some of my own googling after my first answer because this came up at Berkeley when I was an undergraduate there as there was a great aerial photo showing a desire line appearing in a grassy area, a fence put up to prevent people from taking that shortcut, and then people continuing to take the slightly longer path that was required around the fence. Anyway, lengthy blog post here about desire lines with great photos and analysis, a short post that focuses on berkeley here, and an la times article about the concept in regards to hiking. This is the specific picture I was remembering. Googling didn't turn up anything about UC Davis being the school that planted lawn until desire lines informed them of where to put sidewalks, but I'm hoping someone else can track down the details of that story, 'cause I'm certainly hoping it's not just an urban legend. I am told that when they built the University of California at Irvine, they did not put in any sidewalks the first year. Next year they came back and looked at where all the cow trails were in the grass and put the sidewalks there. Perl is designed the same way. I'd always heard that story attributed to Dwight Eisenhower, during his tenure as Columbia's president. Googling for proof now fails me, though. Focusing on a plan for an extension to the University of Oregon, this book shows how any community the size of a university or small town might go about designing its own future environment with all members of the community participating personally or by representation. When I visited Tufts, I heard that story from the tour guide. Three years ago when Pratt Institute repaved their walkways from blacktop to brick, they added a few routes based on the desire lines in the worn grass. The problem with this method is when there are too many distinct start and end points, and your lawn starts to look like a spirograph. Wow. Great answers. Knowing the phrase "desire lines" would have helped me greatly from the start, as "university" & "sidewalk" with several other variables failed to yield very much. Thanks all! How Buildings Learn: What Happens After They're Built talks about how architecture changes to accommodate people's needs, and talks about desire lines. According to my father, Long Beach State did something similar. 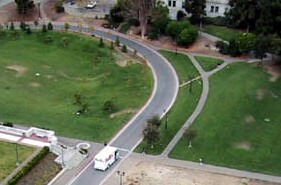 Currently, there are concrete paths that run along grassy areas with diagonal paths that run from high traffic areas to other high traffic areas. Seems perfectly logical and smart. Typically buildings in a university setting are designed to have doors facing on the main paths. A properly planned campus should already be laid out with the most efficient pathways without having to resort to it afterwards. Engineering studies can be done to research origins and destinations by surveying random groups of drivers or pedestrians. From that data, major paths can be determined. The plotting of worn grass pathways seems like an obtuse, non-engineering approach. Why wait an entire year or semester when you could complete a more accurate origin and destination survey in a few weeks? Univeristy of South Florida's Tampa campus supposedly put in their sidewalks this way; at least they still claim they did on their orientation tours. I've heard the same about Iowa State and/or University of Iowa, but google didn't offer much assistance. I've heard that Carnegie Mellon did the same thing. I attempted a project on this last semester. Didn't get very far myself, but I found this fascinating study. A properly planned campus should already be laid out with the most efficient pathways without having to resort to it afterwards. I agree. It's not like people take really surprising paths when given the choice. They take the shortest one. Campus designers could easily lay out the paths like that in the first place, but the traditional design is straight-line paths around the edges of a courtyard, with pretty square lawns in-between. Trail formation is actually a fascinating topic of considerable theoretical interest in the life sciences, as an example of emergent behaviour mediated via stigmergy. See, for example, this paper, the link to which is a bit odd but it will generate a PDF if you let it think for a minute. Figure three, for example, shows that such trails are not always straight, smackfu's confident assertion notwithstanding. Rumple mentioned: Trail formation is actually a fascinating topic of considerable theoretical interest in the life sciences, as an example of emergent behaviour mediated via stigmergy. See, for example, this paper, the link to which is a bit odd but it will generate a PDF if you let it think for a minute. Figure three, for example, shows that such trails are not always straight, smackfu's confident assertion notwithstanding. The actual location of the PDF is here, thanks. You were linking to the gzipped postscript file?!? While there are reasons for a pathway not being straight (trees, pools, sculpture, etc), the figure you quote is a poor example. Sure it evolved that way but given a straight pathway laid over the same location instead of the horrible paths originally laid out, the pedestrians would remain on the sidewalk. Obviously an 8-ft wide, straight strip of concrete is not going to have the entire surface used equally but pedestrians do adapt to their surroundings. Most walkers will go out of their way and stay on the concrete to avoid a persistant mud puddle. In the midwest, where the Canadian Goose has made a home of most every grassy spot, people will avoid walking on the "minefield" altogether.